Cookies are very small text files that are stored on your computer or mobile device when you visit some websites. Cookies can originate from either the website you are visiting (first party website) or a third party external service, for example for use in advertising. Cookies allow a website to recognise if your computer or mobile device has visited that website before. Therefore they can be used to help understand how the website is being used, to remember your website preferences and improve your experience whilst browsing it. Cookies can also help ensure any advertising you receive through a website is applicable based on your interests. It is generally accepted that there are four categories of cookies: “Strictly Necessary,” “Performance,” “Functionality,” and “Targeting.” Betting Promo Codes does not currently use all four categories of cookies to power this website, as specified below, where details on each type of cookie are given. Strictly Necessary Cookies. These cookies are essential for the correct functionality of the website. Performance Cookies. These cookies may be used to gather information about how our visitors use the website. They can also track overall website usage and allow us to make changes to improve how the website works. Functionality Cookies. These cookies are used to remember user preferences when visiting a website. Betting Promo Codes does not currently use this type of cookie. Targeting Cookies. Our affiliate advertising partners or other third party partners may use these types of cookies to deliver advertising that is relevant to your interests. These cookies can remember that your computer or mobile device has visited a website, and may also be able to track your browsing activity on websites other than Betting Promo Codes. It is necessary for this information to be shared with our affiliate partners to deliver the exclusive offers available on the website. These targeting cookies are further used to monitor advertising campaigns, and to provide aggregate website usage statistics. How long do cookies stay on my computer or mobile device? There are two types of cookie, “persistent” or “session” cookies. Session cookies are used only for a single browsing session, whereas persistent cookies remain on your computer or mobile device until they expire or are deleted. A good resource for further reading on cookies is Aboutcookies.org. There is a section there that explains how you can control and delete cookies. Please note that if you make changes to your browser to prevent some or all cookies, you may not be able to receive all the services from our website. We work directly with the bookmakers to bring our visitors the latest and most valuable promo codes. The information on this website is provided entirely free of charge and we always endeavour to keep it up to date. It remains your responsibility to confirm the accuracy of any offer and the terms associated with it. 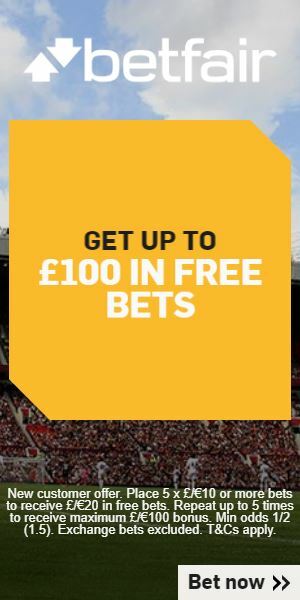 You should always check this information on the bookmakers site. We encourage responsible gambling. Remember that by gambling you are purchasing entertainment and that it should be fun. If you think gambling is affecting you, please ensure you take some time to visit the websites of these or other organisations that are there to help. They offer vital support for people affected to any extent by problem gambling. You'll find freephone numbers, live chat and forums where you can anonymously discuss any concerns. Under UK law you must be 18 or over to gamble. This site is not intended for use by anyone under the age of 18.